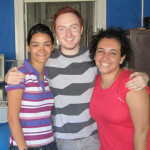 Summary of the project: I spent a month with an HIV/AIDS NGO in Recife helping to decrease discrimination about people who are living with the virus. Harry Dromey is an Account Director at Leo Burnett and he came out to work with GTP+ in October 2010. Harry has been at Leo Burnett since he joined as a graduate trainee in 2005. For almost three years he has been immersed in the world of McDonald’s, who have been enjoying record breaking sales and picking up a few creative awards at the same time. Spare moments away from the lightening-paced world of McDonald’s are used to help recruit and train new graduate recruits for Leo Burnett (…that’s not wholly true because I also spend an inordinate amount of time on Facebook). Before working on McDonald’s, Harry worked on Proctor & Gamble’s laundry brands Daz and Fairy Non Bio although you certainly wouldn’t have guessed looking at his extensive collection of knitwear that has been shrunk in the wash. Fortunately Harry and the team were better at brand building, winning an IPA effectiveness award, a splattering of creative awards and being rated P&G’s best rated team globally. There was also the Home Information Pack campaign for the Office of the Deputy Prime Minister, where he was responsible for delivering an integrated, through-the-line campaign, with a large digital element to complement the above-the-line activities. His boss was former TIE recruit Ed Richards. Harry grew up in south east London where he still lives. He spent three years at the University of Bristol where he read politics. There was then a year working for The SMART Company, who are a corporate responsibility agency. Here he helped create partnerships between companies and charities to benefit the local community. Immediately before Leo Burnett, Harry spent a year in southern Tanzania. Here he worked to raise awareness of how to prevent HIV/AIDS. Outside work, Harry spends a huge time torturing himself by following his beloved but underachieving Crystal Palace Football Club. He also plays for a team called Crystalmeth Palace who (at the time of writing) are top of the league partly due to the goals coming from his lethal left foot. Other than that, a huge amount of time is spent at music events and sitting, feeling guilty about having not cleaned the fish bowl (poor Beatrix and Killah). To learn more about Harry's project, click here.